Chelsea manager Maurizio Sarri has been criticised by two former Premier League stars over his treatment of N’Golo Kante, who they believe is playing in the “wrong position”. Kante has established himself as one of the world’s elite defensive midfielders in recent seasons, after bursting onto the scene with Leicester City. Back-to-back Premier League titles with the Foxes and Chelsea cemented his reputation, while Kante also played a starring role in France’s World Cup win this summer. But he has been shunted out of position since the arrival of Jorginho from Napoli, Sarri’s former club. Chelsea’s failings were laid bare in Saturday’s 3-1 defeat at the hands of Tottenham , and both Jamie Carragher and David Ginola focused on Kante’s woes. “Jorginho will not move from that position. He is Sarri’s man and he has built his system around him. Kante’s not moving because he’s signed a massive contract,” Carragher explained to Sky Sports. “Jorginho has been excellent this season, and teams are having to change their system and style to counteract Jorginho, so that shows how good a player he is and how important he has been to Chelsea. “Kante is a very average player in the position he’s playing in now. I just see a normal midfield player. When he plays here (in Jorginho’s role) I see someone who is world-class. “What do you do as a manager? For me, I don’t ever think this balance of the midfield looks right with Kovacic in there. Former Spurs and Newcastle United star Ginola went even further in his criticisms of Chelsea for misusing such a “quality” player. “Kante in the French team plays right in the middle. When you have a quality player like Kante, you play him in the middle,” the Frenchman said of his compatriot. “That is where he is best. For the French team he had a magnificent World Cup. We don’t talk much about N’Golo Kante because he’s very modest and very humble. I love him. “If you take him away from the French team, it doesn’t look the same. This position in modern football is the key position. If I was a manager tomorrow my first thought would be ‘who is going to play this position?’. 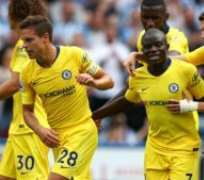 Saturday’s defeat saw Chelsea lose ground on Premier League pace-setters Manchester City and Liverpool, who both recorded easy wins at the weekend to remain unbeaten so far this league season. The Blues, who surrendered their own unbeaten record to Spurs, now sit seven points behind City, while they also saw Tottenham leapfrog them into third.